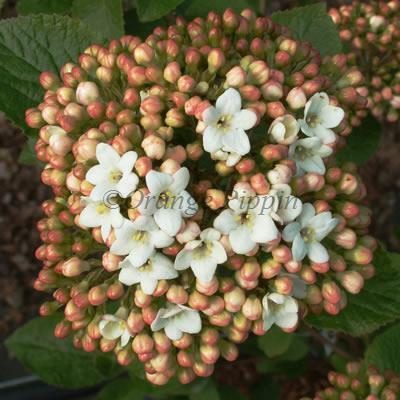 Viburnum carlesii 'Compactum' is a lovely, slow growing shrub of compact, rounded habit. Pink buds open in spring to sweetly fragrant white flowers which are arranged in snowball-like clusters, followed by blue-black berries in late summer. Broad, oval-shaped, dark green leaves turn red in autumn, sometimes displaying shades of wine-red to burgundy. This non-evergreen shrub is perfect for attracting wildlife and can be grown within a mixed bed, border or planted as a hedge.